Representatives from regional health care facilities, consumer advocacy organizations and government groups met at Monongahela Valley Hospital recently to launch a collaborative patient-centered initiative to improve the transition of health care between providers and lower the costs of health care by reducing the rate of unplanned hospital readmissions. Called the Western Pennsylvania Community Care Transitions Coalition, 91 representatives signed the charter creating the group and outlining its aims, principles and procedures during the half-day meeting. 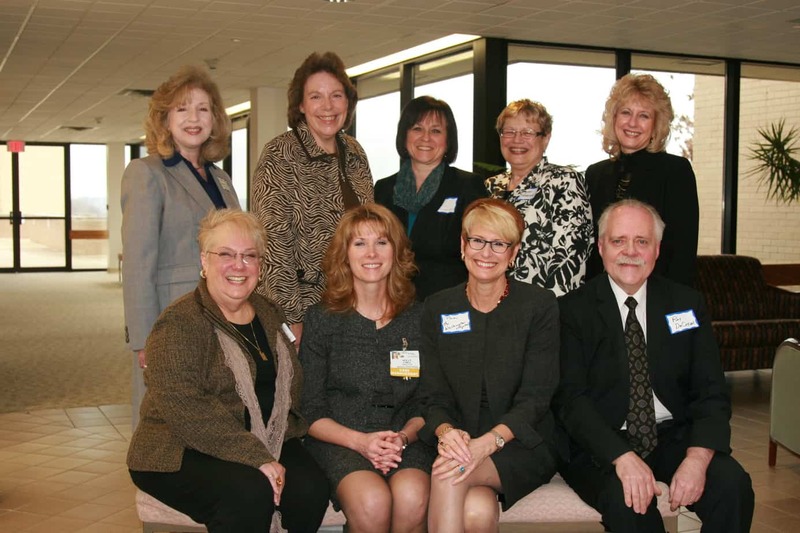 Health care leaders in the region gathered Feb. 24 to form an information-sharing collaborative to enhance patient care. Members of the coalition’s leadership work group are sitting, from left, Naomi Hauser, director of Care Transitions Project, Quality Insights of Pennsylvania; Holly D’Amico, director of Medical Resources for Excela Health; Pamela Cummings, director of case management, The Washington Hospital; and Ray DuCoeur, administrator, Westmoreland County Area Agency on Aging. Standing are Debbie Morris, director of Quality Service for Canonsburg Hospital/WPAHS; Donna Ramusivich, senior vice president of Monongahela Valley Hospital; Denise Abraham, Director of Medical Management for The Washington Hospital; Donna Anderson, project coordinator, Quality Insights of Pennsylvania; and Leslie Grenfell, executive director of Southwestern Pennsylvania Area Agency on Aging. The six acute-care hospitals that joined are Monongahela Valley Hospital, Canonsburg General Hospital/WPAHS, Excela Health: Frick, Latrobe and Westmoreland and The Washington Hospital. Other partners include the Westmoreland County and the Southwestern Area Agencies on Aging, plus 16 home care/hospice agencies and 15 skilled nursing facilities that receive patients from these acute care hospitals. With the theme, “Partnering, sharing, enhancing community care and outcomes,” the coalition will, over three years’ time, strive to achieve a 20 percent reduction in the rates of unplanned hospital readmissions that occur within 30 days of discharge. The coalition will build and sustain a group focused on improving transitions of care for Medicare beneficiaries; become a vehicle of change to improve patient and family experience within the health care delivery system; encourage patient and family participation in each patient’s care; and collaborate and encourage efforts of organizations with a shared purpose of improving care and reducing readmission rates. Senior Vice President of MVH Donna Ramusivich said planning for the group began Aug. 1, 2011, when the Western Pennsylvania Community Coalition leadership work group met weekly to plan the kick off, write the charter and set the group’s goals.